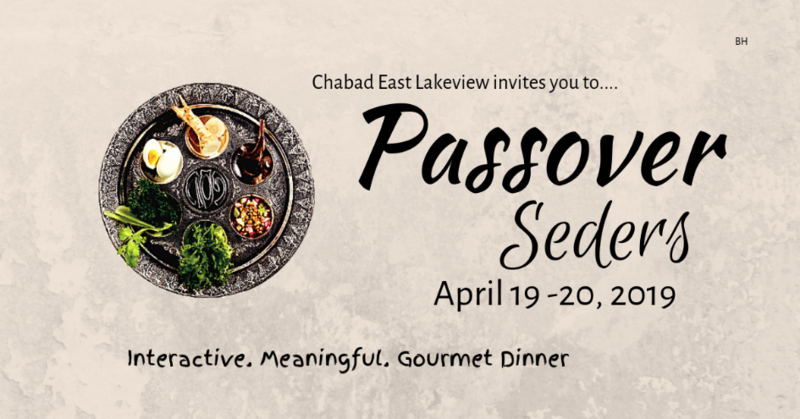 Join Chabad East Lakeview for an inspirational Passover Seder(s) and experience the deeper meaning of Passover in a warm and motivational environment, complete with a delicious catered traditional Seder dinner , insights, singing, four cups of wine , and Matzah galore! Whether you are a seder veteran or a curious explorer, the Chabad seder offers a stimulating and satisfying experience. Whether you are a Seder veteran with answers to all 4 questions Or a curious explorer with 40 questions of your own, Chabad’s Seder offers a stimulating & satisfying experience! Fee* (cover cost): Adult $50 | YJP $40 | Children $25 (children under 3 is free). Thanks to a kind local donor we have 10 tickets available at half price. Please choose your option below. There is also a option to name your own price - no one should hold back from coming due due to lack of funds! Thanks to a local donor we have 10 tickets available at half price. If the price above does not work for you, choose here. If this option does not work name your price below.